Do your gutters need cleaning? 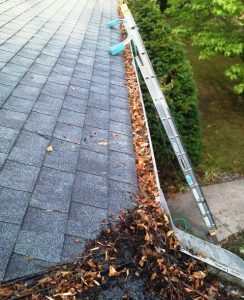 home > Rental > Do your gutters need cleaning? It’s fairly easy to tell when your gutters need a clean. Gutters should be able to handle most normal periods of rainfall, so when gutters begin to drip or completely overflow, it’s usually a sign that they need a clean or professional inspection. The most obvious signs your gutters are full, is you can see leaves overflowing out of the gutters and sometimes birds will also hang around your roof to make the most of the pooling water caused by blocked guttering. Before the Winter rains really begin to fall, it’s an excellent time to check your gutters and see if they need to be cleaned prior to any potential property damage occurring from blocked or full gutters. Overflowing or blocked gutters can cause water leaking into your ceiling and cause further property damage if not dealt with by a simple gutter clean. If you can see any visible signs that your gutters need to be cleaned, please contact your property manager, so we can arrange to have the gutters cleaned now before the Winter rains.